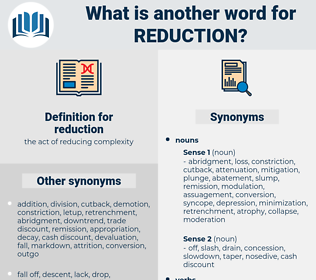 What is another word for reduction? reducing, reduce, decline, drawdown, scaled-down. reducing, reduce, decreases, mitigation, decline, drawdown. diminution, downsizing, reducing, reduce, Diminishment, shrinkage, draw-down, mitigation, decline, drawdown, scaling-down. cutbacks, alleviation, abatement, minimization, cutting, cut, cuts. contraction, cutback, alleviation, depletion, minimisation, devaluation, abatement, minimization, cutting, cut, moderation, trimming. breaks, dive, decreasing, eradication, limitation, limitations. retrenchment, shortening, narrowing, lessening, compression, dive, downturn, commutation, downgrading, erosion, markdown, slowdown, regression, loss, deletion, decreasing, downscaling, lightening, degradation, eradication, removal, resorption, constraint, amelioration, shortfall, scaling, depression, abolition, dismantling, cutout, limitation, weakening, abbreviation, decrement, retreat, underexpenditure, discontinuation, rollback, saving, drop-off, Halving, emission, dwindling, slowing, restraint, Bridging, abridgement, simplification, extraction, softening, phasing-out. increased, Eliminated, reported, Dwindled, Shrank, slashed, Struggled, contracted, Waned, Provided, Dampened, diminished, Fought. minimising, Reining, ameliorating, moderating, eroding, constraining, disappearing, offsetting, slashing, diverting, derating, waning, Abolishing, creeping, Depleting, squeezing, clearing, Stemming, downsizing, shortening, narrowing, lessening, scaling, dismantling, saving, dwindling, slowing, Bridging. Eliminated, Receded, Curtailed, relieved, Discounted, shortened, shrunk, alleviated, lessened, narrowed, mitigated, projected, slashed, Subsided, Targeted, subtracted, fallen, Abated, depleted, Languished, diminished. diminishes, lessens, Measures, struggles, strives, works. uptick, accession, uptrend, appreciation, boost, extension, upturn, upswing, continuation. October 7th, 1809. Should the Austrians make their peace, which I am convinced they must, the next object of Bonaparte will be Turkey, and probably the Austrians be engaged to assist him in the reduction of it. I have made a reduction, too, upon what he drew from his place of prime minister, and that of the post. rededication, reed section, root system, radio station, ratchet down, redaction, rhytidectomy. 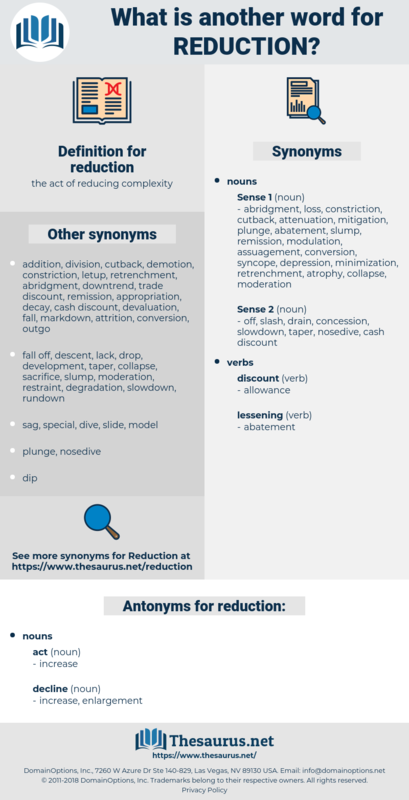 discount, depletion, devitalisation, easement, amortization, shelter, mitigation, devitalization, depreciation, deduction, palliation, minimization, minimisation, relief, contraction, easing, amortisation, declassification, reverse split, subtraction, shortening, de-escalation, reverse stock split, deflation, devaluation, cutback, weakening, price reduction, split down, tax credit, cut, tax shelter, rollback, shrinking, moderation, extenuation, schematisation, lowering, schematization, alleviation.